Western media didn’t even report — and more than a decade after the fact, they still are not reporting — that George W. Bush was lying when he said on 7 September 2002 that the IAEA had just issued a report saying that Saddam Hussein was six months away from having a nuclear weapon — when he said this even though the IAEA repeatedly denied having ever issued such a report. (And: largely because Western media still don’t report that he had lied there, the Gallup Poll, on 20 June 2014, found that former President George W. Bush was continuing to be well-regarded by the American public: he still had an approval rating of 53%, and only 44% of Americans disapproved of him. When will Western ‘news’ media start behaving as if they’re actual news-media in an authentic democracy, instead of mere propaganda-outlets for their government against the various nations that the local aristocracy (the Western aristocrats who also own the ‘news’ media) want to take over or else destroy — first, Libya, then Ukraine, now Syria — all allies of Russia (as had been Saddam Hussein’s Iraq), which Russia is the American aristocracy’s actual ultimate target here. It wasn’t publicly revealed, that Nayirah was a member of Kuwait’s royal al-Sabah family, she was the daughter of Kuwait’s Ambassador to the United States, Saud Nasser Al-Saud Al-Sabah. The al-Sabah family plus the National Parliament, own Kuwait (they jointly control the country and own its oil wells), and the al-Sabahs had hired Hill and Knowlton for this propaganda-operation. None of that was revealed to the public when “nurse Nayirah” was shown crying on U.S. television as she testified lying in Congress. What the al-Sabah family were actually crying about was the theft of Kuwait from them, after they had (centuries earlier) largely stolen Kuwait from the Kuwaiti public and privatized it largely to themselves. For this theft from the al-Sabahs and from the National Parliament, the Bush family, long allied with the Saud family (friends of the Sabah family) sent America’s soldiers in to kill, and be killed, in Kuwait. We know why the Bushes did this. Why is Obama doing it? Who are his friends? No one pays me to write this sort of thing. I offer my news reports and commentaries free to all American and many other Western news-media, in order to persuade them that they should start to become honest — and also in order to encourage readers to support the few that already are honest enough to report the truth about what has actually happened to the media in the Western world (google the headline to this report between quotation-marks, and see who published this and who didn’t). The reason that I do this is that the biggest news-story of all, to me, is actually about the press itself. (Incidentally: America’s self-styled ‘critics’ of the press, such as MediaMatters, FAIR, and AIM, don’t report this particular news-beat either — they too are mere propaganda-vehicles.) And, in fact, the biggest scandal is that there is no market for honesty in the journalism-profession in the West. The West is all that I know about and have investigated; so, I can’t say whether this corruption is the same elsewhere, and I won’t speculate about that. My concern is the corruption here, not there. And I have found lots of that corruption, such as: here and here and here and here and here and here and here and here and here and here and here and here and here and here and here and here and here and here and here and here and here. Until the Western press starts reporting its own corruptness, democracy will be impossible in the West. Wars and other catastrophes can be the result. 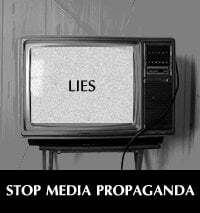 Criminal invasions such as of Iraq in 2003, or perhaps even of Russia itself yet to come, can result from a lying press. That’s why I am concerned about this. * Regarding the RT investigative news report that starts this article, the BBC even had the nerve to headline, after it was telecast, a ‘news’ report supposedly exposing the RT news report as false, while not identifying anything in it to be false. On 21 September 2015 they headlined, very misleadingly, “UK regulator Ofcom backs BBC in Russian TV case,” and opened (also misleadingly saying what had allegedly been affirmed in what they had ‘won’): “The BBC has won a case against Russian TV channel RT, which claimed the corporation faked a report on Syria. The station [RT] said the BBC had ‘staged’ a chemical weapons attack for a news report, and digitally altered the words spoken by an interviewee. Nothing was identified in this BBC ‘news’ article as having been ‘misleading’ in the RT news report. And, specifically, RT’s allegation that the BBC had staged and “faked a report on Syria” wasn’t actually denied in the BBC’s article (though the opening of the BBC ‘news’ article misleadingly suggested that the charge that the BBC had engaged in fakery there had been found by Ofcom to be a false allegation by RT as the BBC was alleging — which wasn’t at all true). However, in order for RT to retain its license in UK, they had to comply with the British regulatory agency’s command. And Britain doesn’t have a censored ‘news’ media? The UK is a ‘democracy’? The Home Team (BBC) can use the home-nation’s media-regulator to punish a foreign competitor that has exposed the Home Team’s lies, and this is supposed to be ‘democracy’? In other words: As regards the BBC itself, accuracy isn’t required, not only in “an investigative current affairs program” but in anything at all which comes from the BBC. Wow! Why would Ofcom — supposedly the BBC’s (and all news-media’s) regulator, say such things? The reason is obvious once one reads the rest of Ofcom’s report. The BBC in its complaint to Ofcom, which had sparked this ruling by Ofcom, provided no documentation disproving or in any way contesting the truth of what the RT news-report had reported. For this reason, Ofcom instead applied a different, totally vague and therefore pliable standard, namely that “factual matters must not materially mislead the audience.” Even if the given “investigative current affairs programme” is 100% “accurate,” it must not “materially mislead” (unless it’s the BBC, which is free to falsify. The BBC is allowed to be entirely inaccurate anywhere, but RT isn’t allowed even to merely “materially mislead” — whatever that’s supposed to mean). Ofcom there stated the BBC’s accusation, using BBC’s original complaint from BBC. However, in fact, Mr. Stuart’s investigative report was “massive,” and it was “public” in the sense of its being online; and, as far as “official” is concerned, that three-word phrase “official public investigation” employed by the BBC in their complaint against RT, used by BBC in their charge filed at Ofcom against RT, describing RT’s references to RT’s investigation, that it was an ‘official public investigation,’ was a fabrication by the BBC: Not once in the RT news-report was that three-word phrase actually used. Never was Mr. Stuart’s report being referenced there as an “official public investigation,” nor was it referred to there as any “outcome of an official public investigation.” (You can easily confirm this fact by examining the transcript of the segment — you’ll need to click there on “Read the full transcript.”) The BBC lied there to Ofcom, and Ofcom simply took their lie on that as being the Gospel Truth. As if the BBC’s faked chemical-weapons attack by Assad’s forces hadn’t caused real harm to the BBC’s viewers — and to democracy itself? That’s right; that’s Ofcom. Clearly, by Ofcom’s phrase there, “unjust or unfair treatment,” they were referring to the BBC as being their client — not the BBC’s viewers, at all. Therefore, RT, afraid that their license will be revoked if any further compaints against them by the BBC are filed at Ofcom, did whatever they were told. According to Britain’s pro-imperialist New Statesman magazine, RT is “Putin’s Mouthpiece” and is thus a threat. So: this is how Britain deals with that alleged situation — by imitating the Soviet Union. A nation doesn’t need to be communist in order to be a dictatorship. Just ask Julian Assange, involuntarily imprisoned for years in the Ecuadorean Embassy in London because he runs an operation (wikileaks) that exposes dictatorships that call themselves ‘democratic’ though they aren’t. Perhaps the most-successful dictatorships are the ones that (like the U.S.) deny that this is what they are. It’s a lot easier to lead the herd to slaughter if they don’t know what is happening behind the wall at the front of the line. Ofcom’s real message to the British public: Get in line, herd!